Lean in a supply chain context is about a holistic view of procurement, manufacturing distribution and sales order processing. This means that some level of enterprise technology is necessary to view the organization in an integrated context instead of as functional islands. However, before technology can facilitate the lean supply chain, manufacturing executives need to start thinking in lean supply chain terms. We will be reviewing those terms and sharing the key concepts that are the foundation for the lean effort. 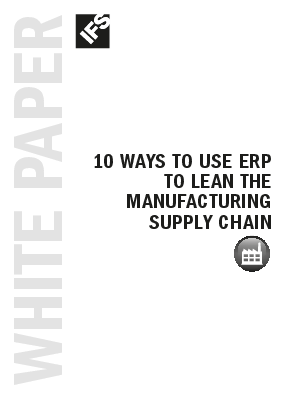 In short, this white paper gives four tips to help you bring lean supply chain improvements to your manufacturing operation. Additionally, it discusses six technology tools that help automate these lean supply chain practices.